We had a little bit of a discussion about keeping our pets clean and what scents we like them to smell like. Funny thing is I am not sure our pets always agree on what we pick for them to smell like. Until they can talk or pull away and I don't mean a little fight while giving a bath to I don't think we will really know for sure if they like it or not. I do however let my pet smell what I am going to be putting on them and so far so good. I have had them in the past kind of turn away so I am pretty sure that is a sign they don't like it. With this shampoo she didn't turn away so it was a go. Bathing a Saint Bernard is hard enough, she just fits in our downstairs tub for her washing. She will get maybe two more baths before winter and then she won't get another until the spring. I don't care if she is a cold weather dog I am not going to let her shake off outside while it is cold. She is getting older and I don't want her to get sick. OK so back to the Fifi & Fido shampoo. While my husband says it smells like coconut cookie while I thought it smelled more like Fruit Punch, either way it makes our pet cleaner and leaves her smelling quite nice too. You can purchase Fifi & Fido Shampoo on Amazon. What Hello Sailor has to say about their product. 100% natural ingredients formulated for dogs, including oatmeal and aloe vera extract used by veterinarians, dog groomers, and dog breeders to promote healing. Soap free with no harmful irritants or preservatives leaves your pet's coat beautifully scented. Combats irritation, moisturizes dry skin and leaves your dog feeling relaxed and happy. 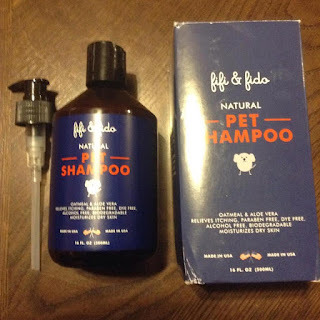 Don't love your Fifi & Fido Dog Shampoo? We will happily send you a FULL REFUND. Disclosure: MarksvilleandMe received one or more of the products mentioned above as part of a promotion with Tomoson and Hello Sailor. Regardless, MarksvilleandMe only recommends products or services we use personally and believe will be good for our readers. Some of the links in the article may be “affiliate links.” This means if you click on the link and purchase the item, I will receive compensation. If you would like MarksvilleandMe to review a product or service please contact us at marksvilleandme@gmail.com.